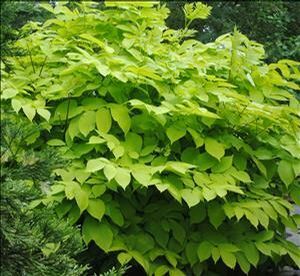 Truly a fabulous plant for shade featuring large golden to chartreuse leaves with reddish brown stems. Quickly forms a large deer resistant clump up to 3 feet tall. Racemes of tiny white flowers are produced in late summer followed by deep purple inedible berries. Native to Japan.